Deliveries start at $8 with an additional $1 per mile from the shop. The following are approximate delivery charges. WHEN SHOULD I PLACE MY ORDER FOR ON TIME DELIVERY? To help ensure on time delivery during the busy holiday season, place your order at least two days prior to the following holidays: Thanksgiving, Christmas, Valentine’s Day, Easter and Mother’s Day. Orders must be received by 12:00 noon to assure same day delivery. Orders received after that time may be delivered the following business day. Funeral home orders and fruit basket orders must be made a day in advance. Orders made at least one day in advance can choose between two delivery windows; early day 10a-2p and late day 2p-5p. Sunday deliveries are available for funeral services only if prior arrangements have been made by 12p on Saturday. All other deliveries must be made the following business day. 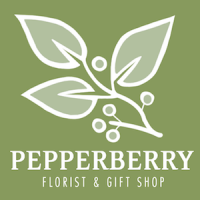 All products ordered from Pepperberry Florist and Gift Shop are 100% satisfaction guaranteed. If you (or your gift recipient) are not completely satisfied with the quality of a delivered product, or it is damaged in anyway upon receipt, it will be replaced.